How does your tarmac grow? 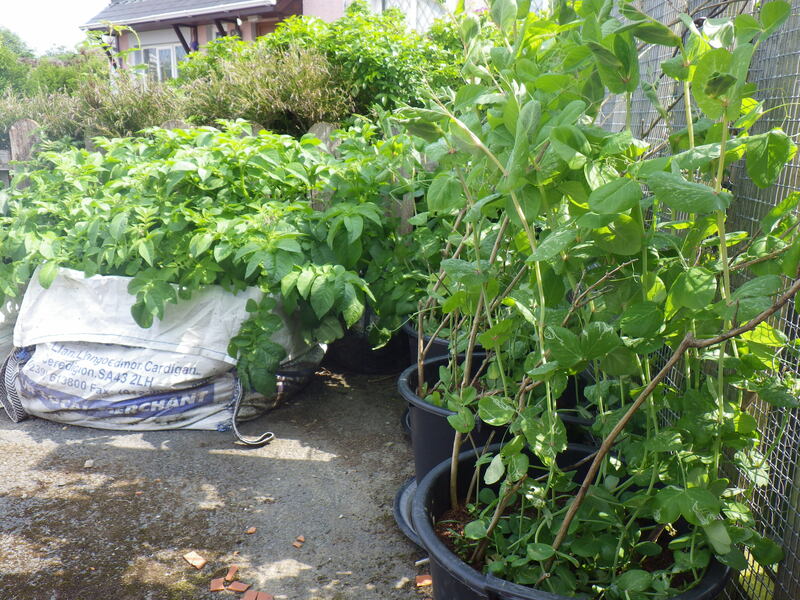 In fact, it’s not the tarmac that’s growing anything, but it is providing the base for various containers, all contributing to our vegetable yield this year. For those of you new to my blog, the area in the pictures used to be a complete waste of space, a corner at the end of the driveway that just accumulated junk. A bit of thought and the application of some permaculture principles, and I have turned this area into somewhere useful. So far this year, we haven’t harvested much from this part of the garden – some lettuce, parsley and about a kilo of potatoes* – but we have high hopes. It’s lovely to see the mangetout, having been guided by “pea sticks” to grow in the right direction, scrambling up the fence. The mesh on the fence was put there to stop the chickens escaping and wandering down the street, but it has turned out to have a second function – supporting these plants (Yellow-podded – a variety that grows up to six-feet tall). 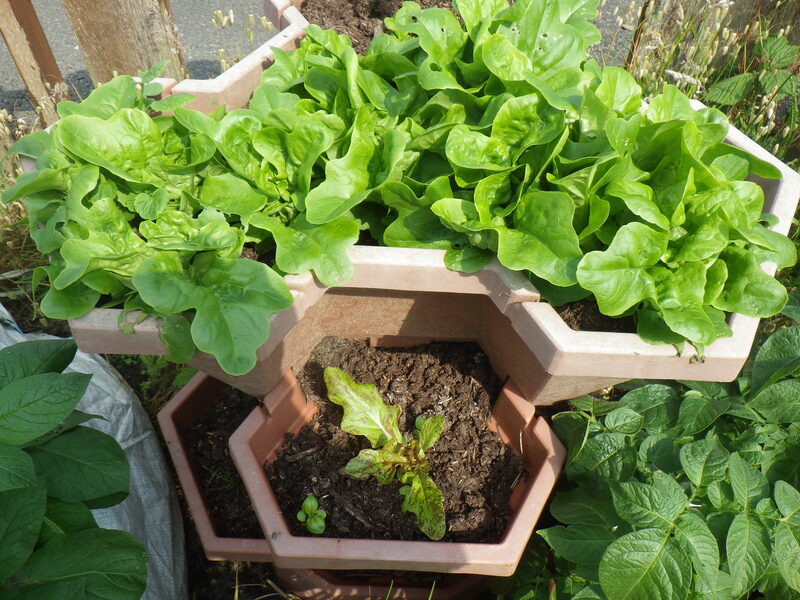 The lettuces are in a container that was originally intended for growing strawberries. Somehow the fruit-growing was not successful, so it has found a new function – multistory leaves – which seems to be going well so far. Sometimes, success just requires some lateral thinking! * It’s early for potatoes yet, but it’s possible to remove some from the edge of the dumpy bags without disturbing the root system too much. Although this will reduce our total yield, it means that I am able to supply us with new potatoes at a time of year when the ones in the shops are very expensive. Those in the soil rather than containers will be harvested later in the season when they have produced their maximum crop. There must be so much unused tarmac and so many unused dumpy bags around the planet – perhaps we should bring them together? Some sort of on-line dating service perhaps?